From an arctic vortex to 60 degree temperatures we’ve experienced winter-to-summer over the last week, what with Mother Nature sending on a markedly bi-polar message. In any event the big event of the week was staged in the Deep South and the comfortable numbers were evident at halftime when the lead singer of Maroon 5 was bare-chested. In any event those of us who have had our full of Tom Brady, Bill Belachick and those hated New England Patriots could only watch incredulously as one of the most boring Super Bowls on record. The Patriots won their sixth NFL title, tying them with the Pittsburgh Steelers for most ever. I’m not the biggest football fan in the world (baseball is my main sports fix) but like most I follow the playoffs and have a favorite team leading up to the annual playoffs. On the film scene Alfonso Cuaron won the Director’s Guild Award en route to a seemingly unstoppable win from AMPAS as the capper on all he’s won so far from nearly every critics’ group. ROMA is a masterpiece for sure and my own #5 film of the year. Our annual Oscar party will be held on Sunday, February 24th at the Tiger Hose Firehouse in Fairview, New Jersey. 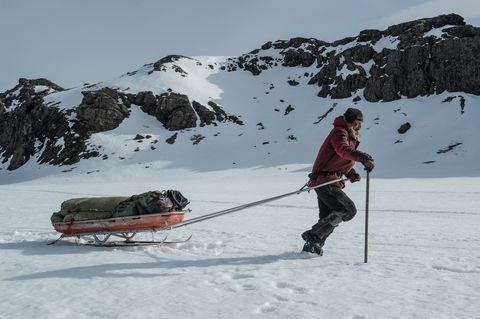 Over the past week, Lucille, Sammy, Jeremy and I took in “Arctic,” a tense, quietly enveloping survival drama set in the punishing tundra near the North Pole, where a man manages to stay alive despite numerous obstacles. Anyone who has read Brian Paulsen’s Newbery Honor book “Hatchet” will understand the mighty odds faced by the non-speaking Mads Mikkelson, who turns in his best performance ever..
Hm. Arctic does indeed sound good. I’ll have to keep an eye out for it. I read somewhere the theory that the Superbowl was so deathly dull this year was that both sets of players realized whoever won would have to go to the White House for cold burgers. Yes I have no doubt at all that ARCTIC is your (frozen) cup of tea absolutely! Have a fabulous week!! Arctic reminds me Cast Away, though the regions are “polar” opposites. Nice to see such a glowing report!